Sunny dining room with vaulted ceiling, slider to backyard. 2019 Listed prices now include $300 cleaning fee and Eastham beach sticker for one vehicle. Listed prices include 5 bedroom house and 2 bedroom cottage. 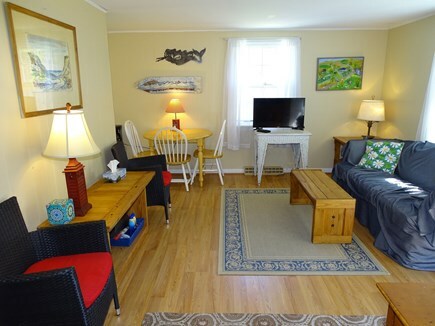 For May, June and September, October ask about individual rental of 2 bedroom cottage. 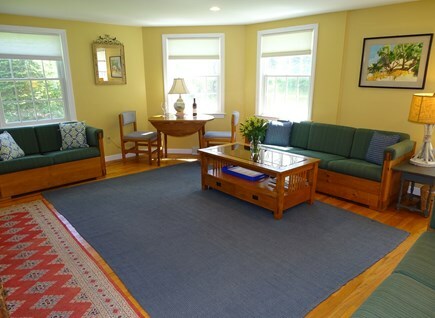 If you are looking for an authentic Cape Cod experience, charm, a private quiet location on a sandy lane, a sprawling back yard close to Campground Beach on Cape Cod Bay and beaches on the Atlantic Ocean, this house is for you. 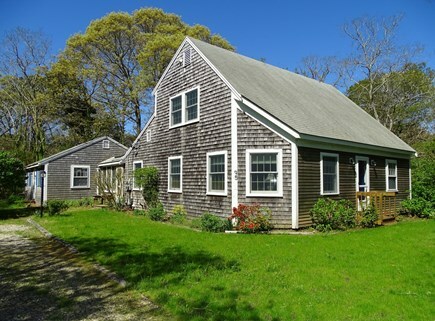 Since Cape Cod is only 3 miles wide at this point bay beaches and ocean beaches are both an easy bike or car ride away. This spacious 5 bedroom home offers lots of room for family and friends. In addition there's a private entrance 2 BR cottage attached townhouse style (no interior connection to the main house). 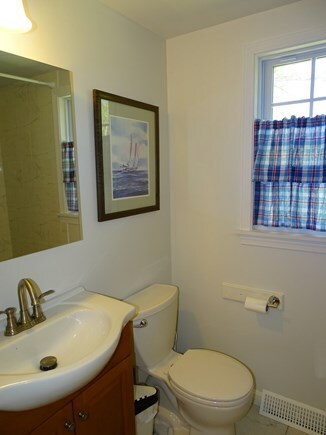 The cottage is perfect for guests who seek privacy while still being part of the larger group. 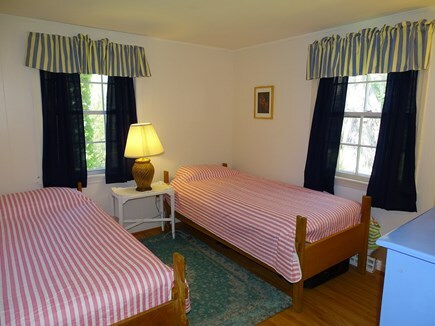 Others have used the cottage as accommodations for a nanny or a private workspace while vacationing in the main house. In the main house, the light, bright kitchen offers a breakfast bar as well as a dining area with sliders to the outside. There are 3 bedrooms and a bath on the first floor and 2 bedrooms and bath on the second floor. 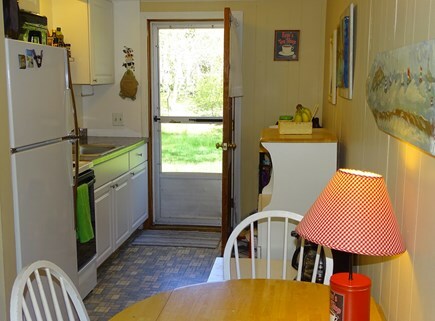 The cottage has 2 BR, bath, LR and kitchen. 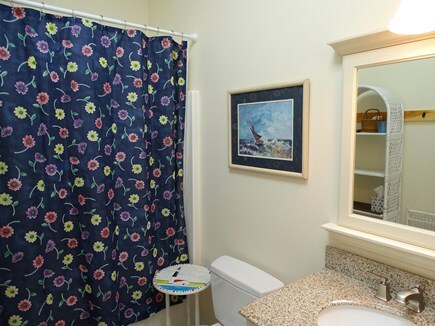 Amenities include a dishwasher, washer/dryer, cable TV, Internet, and an outdoor shower. Spacious back yard with mature shade trees, tables and chairs is the perfect spot to read and picnic or to relax and barbecue after the beach. 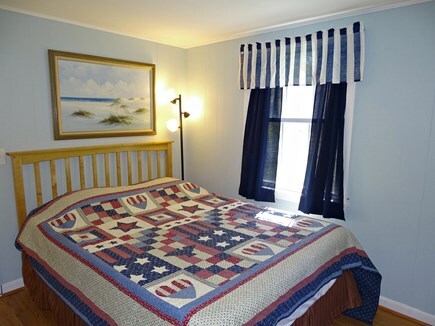 The property is located 1 mile from Cape Cod Bay and the Atlantic Ocean, each an easy bike ride away! 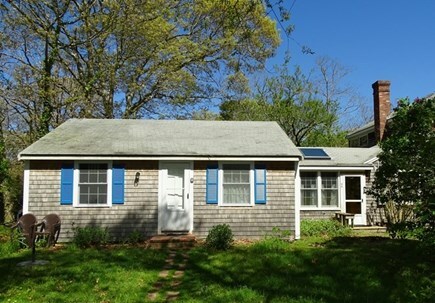 Eastham is a highly desirable vacation destination and home to the Cape Cod National Seashore Visitors Center. 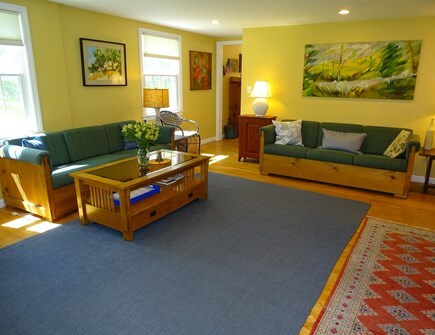 Eastham is a convenient to drive to all major attractions including Provincetown. Additional availability info: In off season and by special arrangement cottage and house can be rented separately. This is a Saturday to Saturday vacation rental. Long-Term Rental (1 month or more): Near bay and ocean beaches. 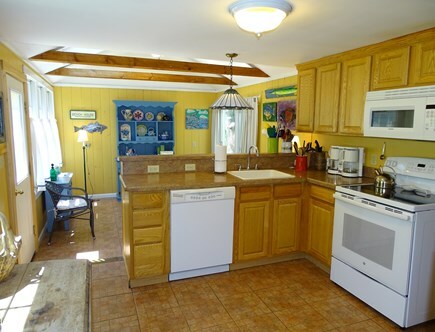 2 bedroom cottage fully furnished with full sized cook stove and refrigerator. Available mid September thru April 30. $1200 per month includes utilities. Cottage is attached to a totally separate 5 bedroom house. Setting has large trees and privacy, perfect spot for those who want a quiet environment where it is easy to be close to nature. 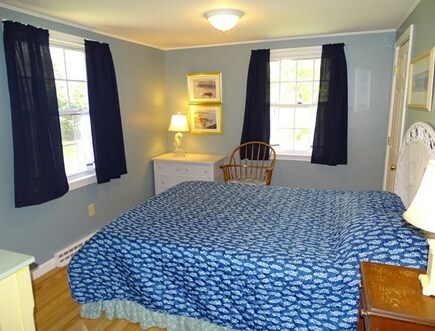 Additional pricing info: Contact owner for pre/post high season 3 night rates.Possible to rent house and cottage separately, State and local taxes of 12.45% will apply. House is a 2 level house with 3 bedrooms on the first floor and 2 bedroom on the second floor. Cottage has a one floor layout. Both buildings are two steps above the outside ground level. Our 3 generation family (12 in all) spent a lovely Cape week in this home & cottage. More than enough room for everyone to rattle around. The cottage was ideal for grandma & grandpops to escape some of the noise and action of the main house, where kids enjoyed the benefit of WiFi and cable TV. The AC was a terrific asset, as the week was hot and humid. The isolation from main roads allowed the kids to ride their bikes around the house, and the rail trail was not far away for an afternoon outing. 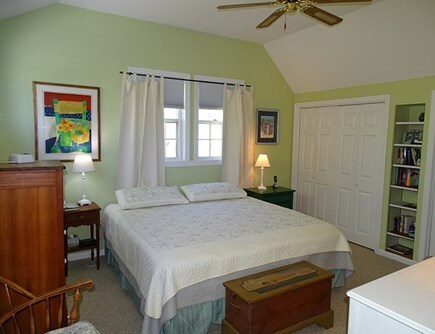 Eastham offers easy access to both the bay and National Seashore ocean beaches. The fresh water ponds are yet another option. This was my first time vacationing at the property, although it was a return visit for my wife and some of her friends. I felt right at home in the spacious, well-appointed house, and also enjoyed hanging out in the large garden. I'm a runner, and found a number of cool (well, shady!) paths to Campground Beach--what a delight to plunge into the water after a sweaty run! I was also pleasantly surprised to find the water so clear and clean (no flotsam 'n jetsam). Sunny and spacious living room. 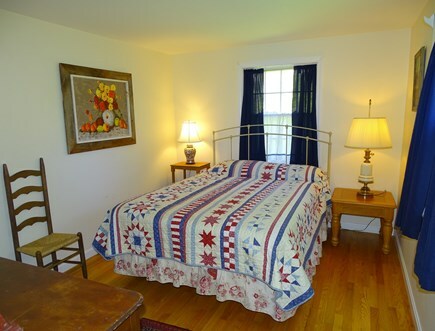 Comfortable bedrooms easily accommodated five (three singles). Backyard seating comfortable for lounging or barbequeing -- good birdsong. Kitchen well outfitted. Two years at this home, and, aside from fantastic weather, our stay here was excellent. Clean, spacious, completely furnished for our entire family's needs - who could ask for more. We all look forward to returning next year with our entire clan. Lovely cottage(s), which can be together with the big house or more private. We've done both. Would be perfect for groups of friends, family groups (our case), and workshop groups. 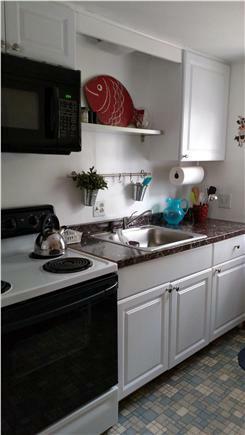 Very practical kitchen(s), large washer and dryer, it has it all. The homeowner Frank is very helpful and friendly. Highly recommended. Thanks for your review. Glad you enjoyed your stay at our property and found the property satisfactory! We are very pleased that you and your extended family are returning again this year to stay at both house and cottage. For others reading your review I want to clarify that there is only one cottage which is attached townhouse style to the larger 2 story house. In most cases house and cottage are rented together by the same group or family. However, especially in the off season, the house or cottage can be rented independently of the other building. Our first experience here was a great one. 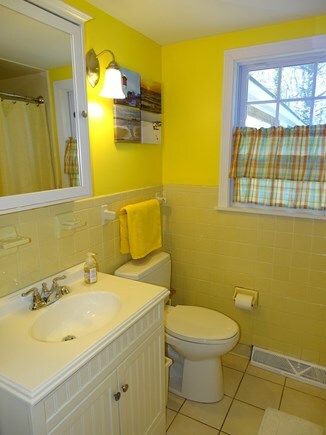 The guest house offers privacy so not everyone is crammed into the main house. Owner was super helpful and easy to deal with. Made the experience stress-free. Recently installed AC was a huge plus as it was unusually humid on the Cape the week we were there. Restaurants close by and beaches as well. Would definitely recommend. We are very pleased that the guests were pleased. 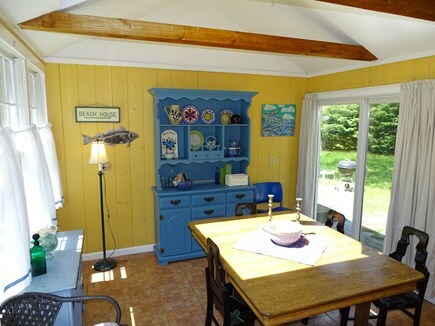 To clarify for anyone reading this review, we want to state that what the guest refers to in the review as the " guest house" on our listing, we call it the "cottage." 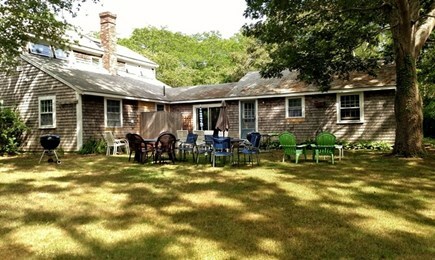 We totally enjoyed our week on the Cape staying in this home with adjoining cottage. It was the perfect size for our extended family. We loved the backyard with lots of tables and chairs and 2 grills, where we cooked out almost every night. Close to the beaches, clean, and lots of room. Hope to be back this summer. Glad you enjoyed your week staying at our home with adjoining cottage. Margo and I are pleased you will return! 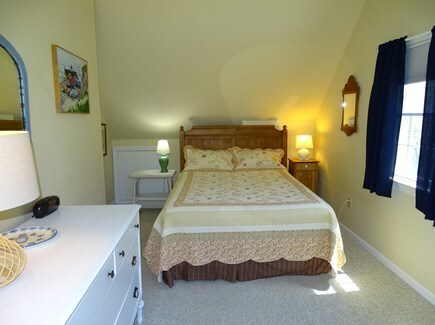 Spacious rooms, new bathrooms, central air, ample seating, terrific backyard, close to eateries, and responsive owners! This property was the perfect setting for a college reunion. 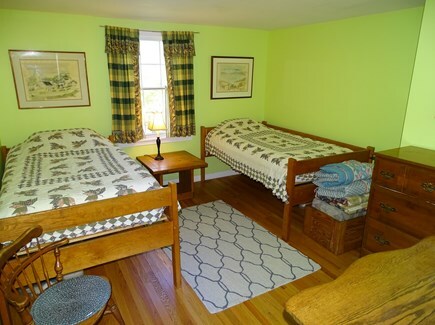 The adjoining cottage was ideal for kids' early bedtimes while adults enjoyed evenings in the main house. Found the house clean and stocked with great odds & ends from coffee maker to board games. Would absolutely rent again!